Receive a personal quote for your project. We can provide a complete roof pack delivered to your door. Please call us on 0116 2743 542 with details of your requirements. Alternatively use our contact page to email your specifications. Unlike glass and acrylic, multi-wall Polycarbonate can be readily cold formed to many bending radii and can be fabricated on site to precise dimensions. To avoid over tensioning of the sheet, the minimum bending radius is 150 times the thickness of the panel. Able to stand extreme abuse, its impact strength is 200 times greater than glass and 10 times greater than acrylic. multi-wall Polycarbonate sheets offer high thermal resistance, promoting energy savings of up to 60% over traditional glazing. multi-wall Polycarbonate sheet is manufactured using state-of-the-art co-extrusion technology combining color, U.V. resistance and durability. multi-wall Polycarbonate is backed by a 10 year limited warranty on light transmission and breakage caused by hail. Multi-wall Polycarbonate is a high performance polycarbonate sheet. During manufacture a layer of U.V. absorber is co-extruded onto the surface of the sheet, forming a barrier against U.V. radiation. This gives Multi-wall exceptional resistance to aging without affecting the mechanical properties and impact strength. 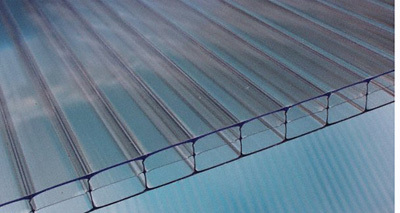 Multi-wall Polycarbonate sheet is classified as Self-Extinguishing. Compared with other thermoplastic products used in the building industry, it will not support flames. Above all, it does not give off toxic gases. Among the thermostatic products used in the building industry, multi-wall Polycarbonate has the highest impact resistance. You can be assured that from transport to installation, will maintain its durability. Even when exposed to elevated temperatures over a long period of time, it will maintain its structural integrity. On-site, it will not crack or splinter, assuring you a high degree of safety. multi-wall Polycarbonate is so strong it withstands the impact of 16 lbs. dropped 25 feet on an 8 mm panel with no breakage. It will maintain its impact strength over a wide temperature range from - 40F to 250F. Correct calculation of expansion in order to provide for the necessary allowance in the framing. The thermal expansion coefficient is 0.0000375 in/in °F. Chemical Resistance of Polycarbonate @ 73° F - The list below indicates the resistance of polycarbonate to chemicals and various products. Resistance can be effected by the chemicals concentration, duration of exposure, degree of pressure and temperature at time of contact. Install the sheets with the ribs running vertically and following bending specifications in bent applications. Washers and sealing materials must be compatible with polycarbonate. is supplied with a protective PE film on both sides which should be kept on until work is completed. The U.V. protected side is to be faced towards the sun and is marked with a white printed film or light blue film and a sticker saying multiwall polycarbonate sheet. crates or sheets should be stocked in an area not exposed to the sun which could make the removal of protective film difficult. Stiff fixing by means of adhesive or putty is to be avoided. Top and bottom ends of a sheet must always be sealed by means of the proper polycarbonate profiles or an adhesive aluminum tape to prevent dust or dirt penetrating the inside of the ribs and will help reduce condensation.